Happy Birthday to me...not. Happy Birthday to me...not. Hey everyone just thought I'd check in again. Anything interesting happen while I was away? FO76 came out, spoilers, Red's birthday, etc. Hi everyone. Thought I'd check in to tell you I'm still around. Finished moving a month or two ago. I got tired of the weekly music thing. Rokas and Daikonradish like this. Excellent progress and finding share-worthy tracks can overwhelm someone after a while. C.S.O.T.W: Rocket Ride (Soulwax remix) by Felix Da Housecat, (Important message in comments). @Kalifox , @Red Dragon the Destroyer , @Bruno The Terrarian , @MinieK, @diekonradish , @Dg-vr. , @Aurora3500 , @Arpiter , @Yssakaar J. Yeshayahu , @Rokas , @Hypalaser , we got plans to move soon which gets very stressful for us so as a result I will be holding off posting for awhile until I'm freed up again. Sorry. C.S.O.T.W: From the Russian group whose name means "No love for the majority" Krank by KMFDM, (Profanity). @Kalifox , @Red Dragon the Destroyer , @Bruno The Terrarian , @MinieK, @diekonradish , @Dg-vr. , @Aurora3500 , @Arpiter , @Yssakaar J. Yeshayahu , @Rokas , @Hypalaser , Song posted! C.S.O.T.W: "Put your hands where my eyes can see" by Busta Rhymes, (Mature content warning). Daikonradish and Rokas like this. C.S.O.T.W: Bad meets Evil by Eminem featuring Royce da 5'9, (Profanity Warning). C.S.O.T.W: Also from the new Steve Aoki album: Anthem by Hardwell & Steve Aoki featuring Kris Kiss. 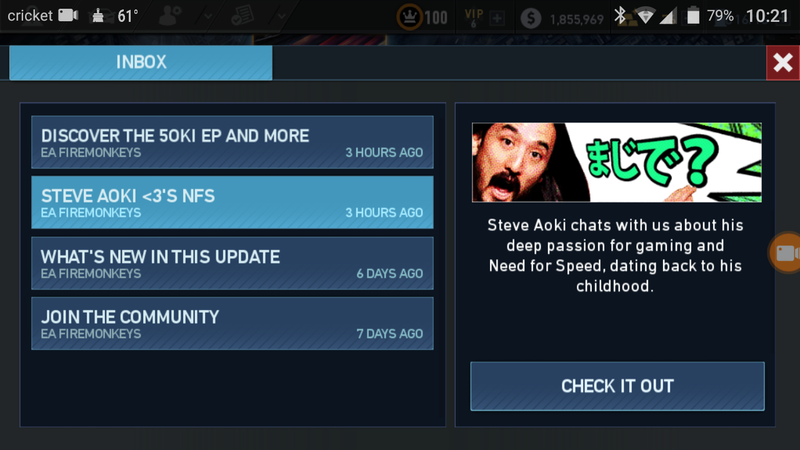 C.S.O.T.W: From Steve Aoki's new EP and part of the NFS No Limits Aoki takeover: Moshi Moshi! This is actually the official music video for the song. There was even a link to it directly from the NFS No Limits inbox. C.S.O.T.W: Bollywood Chick by Swollen Members. I recommend listening to this while playing street racing games. MinieK, Rokas and Daikonradish like this. C.S.O.T.W: Paul Revere by Beastie Boys. C.S.O.T.W: "Enough" by Gravity Kills. altermaven, Rokas and Enroke like this. C.S.O.T.W: "Step up" by Drowning Pool. Used in the 2004 Punisher Movie, (Mature content warning). @Kalifox , @Red Dragon the Destroyer , @Bruno The Terrarian , @MinieK, @diekonradish , @Dg-vr. , @Aurora3500 , @Arpiter , @Yssakaar J. Yeshayahu , @Rokas , @Hypalaser , I would use the actual music video for this song but I feel it just might be too much for this site so anyone who wants to see it go look it up yourself. C.S.O.T.W: "When Worlds Collide" by Powerman 5000. Hypalaser, Daikonradish and Rokas like this. C.S.O.T.W: Firestarter by The Prodigy, (Profanity Warning). C.S.O.T.W: Get it together by The Beastie Boys featuring QTIP, (Profanity warning). C.S.O.T.W: Bombshell by Powerman 5000, (Possibly considered mature content). C.S.O.T.W: "Let's go" By Travis Barker featuring Yelawolf, Twista, Busta Rhymes, and Lil Jon, (Mature content). C.S.O.T.W: "Touch it" by Busta Rhymes, (Profanity warning). C.S.O.T.W: "Calm down" By Busta Rhymes featuring Eminem, (Strong Mature content warning). My name is Jacob. I have been diagnosed with Aspergers syndrome which legally counts as a disability. Its a form of autism which slows mental development and sometimes has caused me to be socially awkward so sorry if I end up sounding weird or stupid sometimes. I've been a gamer all my life and I usually play shooting games and whenever I wanted to play a mining game, Minecraft used to be my go-to but when I found out how awesome Terraria is I had to switch. I mainly play Xbox so I'm a console Terrarian. I stick to the same tag everywhere I go online so if you want to come join a game my XBLGT is Clancy117 but I gotta warn you my connection isn't always so good so don't expect to join a game right away if I add you.